We recently visited the Malwa region in MP to gauge the mood of farmers and ascertain overall demand for agri-input in the Rabi season. The Malwa belt is herbicides heavy, forming ~65-70% of total agrochemicals consumed in the region. As a result, herbicides consumption has been healthy this year. Rising labor cost also has led to increased consumption.§ However, this year the pest attack to date has been low, due to favorable weather conditions; hence, the sale of insecticides has dropped. Channel inventory of insecticides has been higher by 15-20% while herbicides lower. As a result, dealers expect lower pre-placement of insecticides at the start of the next season, but they will be looking forward to place orders for herbicides from April. The government has estimated ~22,000 hectares of land was damaged due to the cold wave and frost while our interactions with farmers and dealers suggest the damage could be higher. *Cover has not been able to grow at the rate at which Coragen has been growing as Coragen enjoys brand loyalty due to the first-mover advantage. According to Ministry of Agriculture, total acreage for the Rabi season until 11 January 2019 was lower by 4.8% YoY, but was up by 3% on a weekly basis. Apart from drought, lower acreage can be attributed to lower price realization seen in most Kharif crops which have discouraged farmers from sowing Rabi crops. Most Kharif produce is attracting up to 30% lower minimum support price (MSP). Wheat sowing has dropped slightly by 2% YoY despite higher acreage in MP, which increased by ~20% YoY. 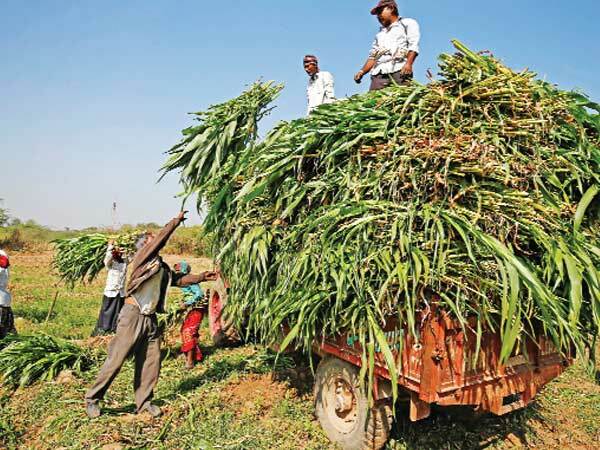 MP farmers have switched from onion and garlic to wheat as prices in the past year had crashed sharply, resulting in huge losses to farmers; for wheat, due to government procurement, farmers are confident of earning a good price. Paddy sowing has seen a sharp drop of 21% YoY, as the acute water scarcity in key regions of Tamil Nadu and Andhra Pradesh due to a deficient northeast Monsoon and weak western disturbances in December. Pulses acreage is down 5.7% YoY while sowing for coarse cereals and oilseeds is lower by 15.9% YoY and 1% YoY, respectively. The drop in acreage has been seen in case of gram due to low area coverage in Maharashtra as it has been hit by drought. Below normal rainfall in most key regions of the country has adversely affected cotton production this year. As per latest estimates by the Cotton Association of India (CAI), cotton production is expected to drop by 8% YoY to 33.5mn bales this year. CAI expects lower crop production in states of Gujarat by 0.15mn bales and Maharashtra and Telangana by 0.2mn bales each. Owing to lower water availability, the pickings also were restricted to two rounds vs four under normal circumstances. Opening inventory stood at 2.3mn bales and the country is expected to import 2.7mn, which is higher than the previous year’s imports of 1.5mn bales.